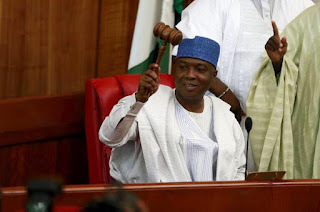 Newly elected President of the Senate, Bukola Saraki yesterday commended President Mohammadu Buhari for standing by his word not to interfere in the selection of the leadership of the National Assembly. Senator Saraki in his inaugural speech said Mr. President’s action has laid a solid foundation for the stability of the 8th National Assembly. “It will be my responsibility to protect the independence of the legislature in the overall interest of our democracy. Also, our quest for autonomy must not lead us into pursuing adverse relations with other arms of government. I salute President Buhari for remaining steadfast in his defense of the right of the National Assembly to choose its own leaders which had laid a solid foundation for the stability of the 8th National Assembly,” Saraki said. Saraki added that the event of yesterday was a clear demonstration that even though they belong to different parties, they are united by a common desire to entrench democracy. He said: “We have today demonstrated that even though we may belong to different parties, we are ultimately united by our common desire to entrench democracy and allow its principle guide our conducts”. According to him, the election of the Senate President and the deputy was a vote for a change and it was their responsibility to justify the change through a proactive Assembly. “The change that our people voted for is a change from a life of poverty and misery to a life of prosperity, happiness, security and comfort, accountability and respect for democracy. “This is a change that all of us in the National Assembly must strive to justify as Nigerians want to see a proactive National Assembly. “As the President of the 8th Senate, I shall be guided by the enormity of the responsibilities that this moment imposes on all of us. I shall strive to be just, equitable and fair to all”.